Cilia on ependymal cells are essential for the flow of cerebrospinal fluid in the brain. 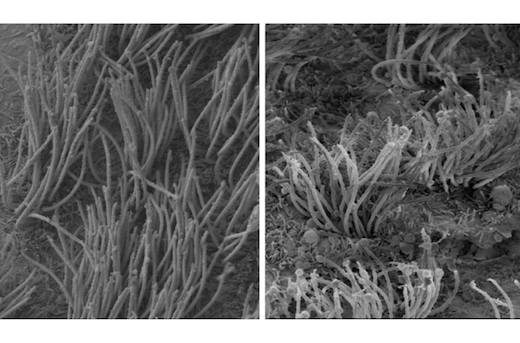 Left shows normal mouse, and right shows cilia from ependymal cells with mutated SHP2 gene. Electron microscopy; courtesy of Cheng-kui Qu. In a mouse model of Noonan syndrome’s effects on the brain, Cheng-Kui Qu, MD, PhD and colleagues observed defects in the cilia on ependymal cells, which are essential for the flow of cerebrospinal fluid. The findings will aid in differential diagnosis of Noonan syndrome versus closely related disorders, and also advance a potential treatment for hydrocephalus in the context of Noonan syndrome. Qu is professor of pediatrics at Emory University School of Medicine and Aflac Cancer and Blood Disorders Center, and a Children’s Healthcare of Atlanta Research Scholar. First author Hong Zheng, PhD is a postdoctoral fellow. Noonan syndrome is caused by mutations in the SHP2 gene that result in hyperactivation of the enzyme it encodes. It is a developmental disorder including congenital heart disease, dysmorphic facial features, short stature, and intellectual disability. Patients with Noonan syndrome also have an increased risk of developing hematological malignancies. A distinct set of inactivating mutations in the SHP2 gene cause a highly related disorder – Noonan syndrome with multiple lentigines (formerly called LEOPARD syndrome), which Qu says can be difficult to distinguish from its Noonan syndrome. Hydrocephalus could be used for differential diagnosis and prognosis, he says. Qu’s lab created a mouse that had the SHP2 gene altered only in brain cells and these mice displayed hydrocephalus. By electron microscopy, Zheng could see changes in the structure of cilia on ependymal cells, which line the ventricles in the brain. The cilia were shorted and disorganized-looking. This defect appeared to come from something intrinsic to developing cells, because aberrant development in ependymal cells and their cilia could be seen in neural stem cells grown in culture. SHP2 encodes a tyrosine phosphatase, an enzyme that regulates signals from several growth factors. The researchers were able to narrow down which downstream signaling pathway was responsible for the cilia defects: STAT3. They were also able to track how different mutations that affect the SHP2 enzyme activities impacted ependymal cell development. SHP2 inhibitors are being investigated as anticancer drugs. Qu’s team used an SHP2 inhibitor in a culture system to rescue problems in ependymal cells. This suggests that those medications might be a tool for controlling the progression of hydrocephalus in Noonan syndrome patients. Researchers at Cincinnati Children’s Hospital Medical Center, Beth Israel Deaconess Medical Center, and New York University contributed to the paper. This work was supported by the National Heart Lung and Blood Institute (HL130995), the National Institute of Diabetes and Digestive and Kidney Diseases (DK092722), the National Institute of Child Health and Human Development (HD087760).